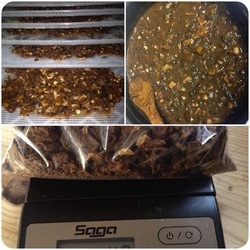 I first began dehydrating food for my John Muir trail solo hike. It was like a science project. Creating, dehydrating and then re-hydrating to see if it was any good. The sky is the limit. Just get creative and everything you've ever wanted on the trail you can have. I've listed a few of my favorite recipes for you to enjoy. * Make sure to mince all ingredients. This will help in the dehydration process. Cook black beans according to package. Caramelize onions in small sauce pan, separately. Mince all ingredient, set aside. Mix all the taco/hot sauce ingredients in a separate bowl. Once beans are cooked mix all ingredients together, but the tortillas and cheese. Let simmer and cook and reduce for 30 minutes (more if you’d like) before placing on dehydrator trays mix in the crumbled tortillas and cheese. Place thinly on the dehydrator trays. Cook for 6 hours at 145 degree’s (may vary depending on type of dehydrator) * I always flip and rotate the trays a few hours in. 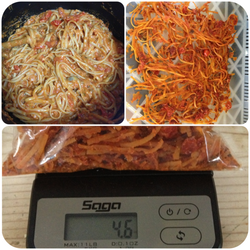 Pack in 4oz portions. Should yield 6-8 portions. To rehydrate and water 1/2” above food level in pot. Bring to a boil & Stir. Let sit 10+ minutes depending on altitude. Sagg Paneer: This recipe is easy and so yummy on the trail! *Spice Mixture: Grind the following spices as finely as possible: 2 tablespoons cumin seed, 1 tablespoons coriander seed, 2 teaspoons mustard seed, 1 teaspoon red pepper flakes, 1/8 teaspoon cardamom seeds, 3 whole cloves. Store in an airtight container and use as needed. While you’re chopping spinach, cook the Tufu in one tablespoon of the butter over medium heat in a large skillet. Make sure the Tufu is in a single layer and use a spatula to flip it regularly so all sides get deeply brown. This typically takes 7 minutes or so. Remove from the pan and set aside. Heat the other tablespoon of butter in your largest soup pot. Add the onions and salt, and saute until the onions soften up, five minutes or so. Add the garlic, ginger, spice mixture, and turmeric. Cook, stirring frequently, until fragrant and nicely combined - a minute or two. Stir in the buttermilk and heat gently while stirring. Taste and add salt if needed. Add yogurt. Add a generous squeeze of fresh lemon juice, stir in the tufu, sprinkle with sesame seeds. Let reduce on a simmer for 20-30 minutes. 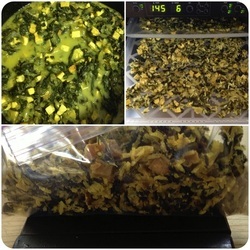 Mix in cooked rice. Place thinly on the dehydrator trays. Cook for 6 hours at 145 degree’s (may vary depending on type of dehydrator) * I always flip and rotate the trays a few hours in. Pack in 4.5 oz portions. Should yield 4-6 portions. To rehydrate and water at food level in pot. Bring to a boil & Stir. Let sit 10+ minutes depending on altitude. Creamy Linguini Pasta: I looked so forward to this one on my food resupplies. It really hit the spot with its yummy flavor! Plus it is supper easy to make. Ina sauce pan place saute all fresh ingredients until cooked. Salt as needed. Break pasta into 1/2 lengths. Boil pasta according to package. Once pasta is cooked mix the jar of creamy pesto sauce and the cooked ingredients along with the Parmesan cheese. Place thinly on the dehydrator trays. Cook for 6 hours at 145 degree’s (may vary depending on type of dehydrator) * I always flip and rotate the trays a few hours in. Pack in 4.5 oz portions. Should yield 6-8 portions. To rehydrate and water 1/2” above food level in pot. Bring to a boil & Stir Let sit 10+ minutes depending on altitude. Vegetable Stew: It may look like baby food, but it was such a delicious addition to my meal plan! One of my favorites! In Dutch oven, saute in olive oil the: onion, garlic, bell pepper and zucchini for 10 minutes. Stir in: garbanzo beans, vegetable stock, and parsley and lentils. Simmer for 15 minutes. Remove from heat add: salt, hot sauce and Parmesan cheese. 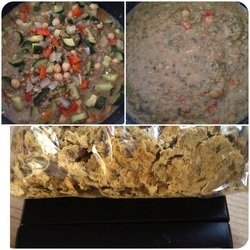 In a blander or food processor puree 2/3 of the stew, the remaining 1/3 will make it chunky. Place thinly on the dehydrator trays. Cook for 6 hours at 145 degree’s (may vary depending on type of dehydrator) * I always flip and rotate the trays a few hours in. Pack in 4.5 oz portions. Should yield 4-6 portions. To rehydrate ad 1 1/2”water above food level in pot. Bring to a boil & Stir. Let sit 10+ minutes depending on altitude. 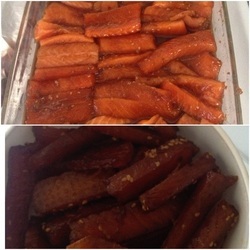 Salmon Jerky: I can’t believe I had never made jerky before this. It was easy and the most delicious jerky ever! Thinly slice the salmon. The thinner the faster it will dehydrate. In a large flat cooking tray place the salmon slices side by side. Cover with Teriyaki sauce. Marinade overnight in a pan (in refrigerator) Oil mesh on dehydrator trays. Lay the fish slices directly on uncovered mesh dehydrator trays. Dehydrate for 4 hours. Turning the slices and dehydrating another 2-4 hours. When completely cool, place in individual serving-sizes bags and store in refrigerator prior to your trip. 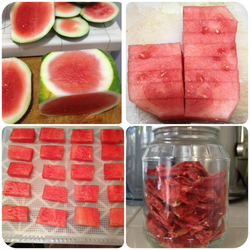 Dehydrated Watermelon: This was like candy. Just the sweetest perfect bite. Slice the watermelon in flat rectangular slices. Place directly on mesh on dehydration trays. Dehydrate at 135 for 6 hours. Turn all slices, dehydrate an additional 6 hours. (may vary depending on type of dehydrator) Place in individual serving-sizes bags and store in refrigerator prior to your trip.